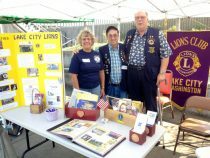 There are so many people in the Community who are not aware of the incredible and positive impact that the Lake City Lions Club have had on the Lake City community. With the upcoming 12th Annual Olympic Hills Pancake Breakfast to benefit the school hosted by the Lions we thought we would share a little bit of the fantastic work the organization has done and continues to do in the neighborhood. Their work continues today supporting North Helpline, Sacajawea Elementary, Olympic Hills Elementary and Nathan Hale High School. This past year they recycled 1500 pairs of eyeglasses and 50 hearing aids and continue to provide eyeglasses and hearing aids for those in need. The Lions provide a health screening unit to three elementary schools for vision and hearing screening. They provided over 200 dictionaries to third graders at four local schools. They are the ones that hang the flags along Lake City Way and work to keep the planters stocked and maintained along the business corridor. They regularly hold the Lake City Flea Market and are the group behind the Annual Fright Night event. They award scholarships and host the Annual “Back to School Barbecue at Virgil Flaim in support of families served through the North Seattle Family Resource Center. From painting out graffiti to awarding a handful of scholarships each year the work they do is invaluable. Interested In Trying “Rapid Transformational Therapy”?